How would you go about getting the remaining 2/3 of crude oil out of old oil wells? Sometimes you can't, but in many cases it is more economical to squeeze more oil out of exiting well -- using enhanced recovery methods -- than to find and drill new wells, or to convert other feedstocks into crude oil. According to the chart above, different methods of enhanced oil recovery vary wildly in terms of cost per oil recovered. They also vary widely in terms of average oil recovered, and the potential for further oil recovery after the technique has been utilised. Microbial oil recovery is one of the least utilised, but promising, techniques. 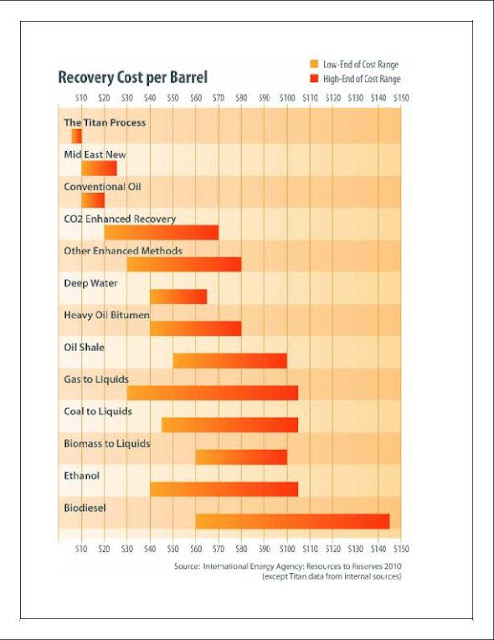 Here is more on the "Titan Process," listed in the topmost chart above as the most economical method of recovery of those listed. More than 20,000 wells are abandoned every year in the U.S. as they become non-commercial. Approximately 285,000 shut-in wells in the U.S. are potential targets for MEOR revival. Internationally there are about 800,000 more shut-in wells, a significant percentage of which may benefit from the Titan Process. As you can see, microbial oil recovery has a lot of room to grow, compared to other EOR techniques. The same is true for other up and coming EOR approaches -- such as nanotechnology EOR. 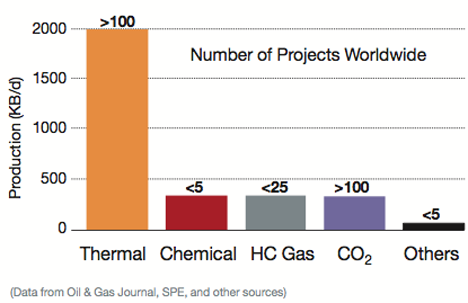 The many different possible ways to produce crude oil and crude oil substitutes offer many potential investments for energy observers. Oil field service companies that provide services such as fracking and EOR are particularly attractive at this time -- as long as Obama and other energy starvationists do not shut them down. Another peak oil doomer argument is that we are so desperate for oil we are look toward old wells and they won't last long. Seems like they are never wrong in their eyes. They have a "just you wait" attitude about everything.